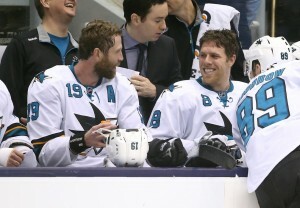 Joe Pavelski may be named the captain of Team USA for the World Cup of Hockey according to CSN’s Kevin Kurz. The San Jose Sharks forward became the ninth captain in franchise history on Oct. 5, 2015, after Joe Thornton was stripped of the “C” after the 2013-14 season. Pavelski, 32, has spent his entire 10-year NHL career with the Sharks after being drafted by the club with the 205th pick in the 2003 NHL Entry Draft. In 725 regular season games, the native of Plover, Wisconsin has compiled 266 goals and 563 points. In postseason play, he has played in 105 games and registered 79 points. In the last three seasons, Pavelski has taken his game to new levels offensively, skating in 246 games and tallying 116 goals and 227 points. In the 2015-16 playoffs, Pavelski helped lead the Sharks to the franchise’s first ever Stanley Cup Final by scoring 14 goals and nine assists in 24 games. Pavelski has represented his country on the international stage three previous times in his career, including skating for Team USA in the 2010 and 2014 Olympics. During the 2010 Olympic Games in Vancouver, Pavelski helped the United States to a silver medal. The World Cup of Hockey is an eight-team international tournament set to take place in Toronto from Sept. 17 to Oct. 1, 2016.